Effective government policy and initiative are necessary in the system of land distribution process to rescue the land from its grabbers for the economic development of Gaibandha district. Media and business leaders deliberated the above opinion in a dialogue held at Public Library Auditorium in Gaibandha today. 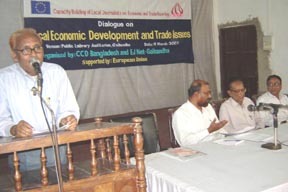 Mass communication oriented development organization CCD and Economic Journalist Network (EJ Net)-Gaibandha organized the dialogue supported by European Union. Presided over by Joint Convenor of EJ Net-Gaibandha K M Rezaul Hoque, General Secretary of Gaibandha Press Club and Journalist of the daily Janakantha Abu Jafar Sabu and President of Gaibandha Press Club and Journalist of the daily Jugantor Gobindo Lal Das presented two reports on “Problems and Potentiality of Trade-Business and Economic Development in Gaibandha” and “Livelihood of the People of Charland: Problem and Potential” in the dialogue. Senior Faculty Member of Rajshahi Krishi Unnayan Bank (RAKUB) Training Institute A B Siddique moderated the dialogue and Project Coordinator of CCD A H M Abdul Hai presented welcome address. Among others, President of Gaibandha Chamber of Commerce and Industries Shahjada Anwarul Quadir, Assistant General Manager of BISCIC Md Altaf Hossain, District Training Officer of Department of Agriculture Extension Md Rofiqul Islam, President of District Shop Owners Association Moksuder Rahman, Senior Officer of Sonali Bank Shomvu Nath Saha, Journalist of the Bangladesh Observer Principal Mokhleshur Rahman, General Secretary of District Motor Owners Association Johurul Islam, Assistant Engineer of Barind Multipurpose Development Authority (BMDA) Shafiqul Islam, Senior Vice President of Gaibandha Chamber of Commerce and Industries Abdul Latif Bakhshi and other noted media and business leaders addressed the dialogue.